President Obama's new paper defending the Affordable Care Act only shows why we need single-payer health care. “Obama on Obamacare” would have been a catchier title for “United States Health Care Reform,” the scholarly paper the president published in the Journal of the American Medical Association earlier this month. Garnering widespread coverage because of its novelty (“call him scholar-in-chief,” noted Fortune) and for its call for a “public option” to further improve the American health-care system, Obama’s article should interest us more for what it left out. The president begins his review of the Affordable Care Act (ACA) with a brief discussion of its roots — including the profound shortcomings of the pre-ACA landscape — before proceeding with a largely rosy, albeit data-based, discussion of progress made under the law. He splits his assessment into two categories — its expansion of insurance coverage, and its reforms of the “health-care delivery system.” Both show the limits of the recent attempts at reform and the broader Democratic Party political vision. As Obama fairly describes, the ACA resulted in a substantial decline in the number of uninsured Americans over the past five years. Using recently released figures, he cites a drop from 16 percent in 2010 (when the law was passed) to barely over 9 percent in 2015 (after its main provisions were implemented) — a change that amounts to around twenty million more insured people today as a result of the ACA. Being uninsured is an obvious injustice. It squeezes the resources of those who can least afford it at the worst possible time, and it takes thousands of lives a year. A major reduction in the rate is a good thing. But there is more to be said. 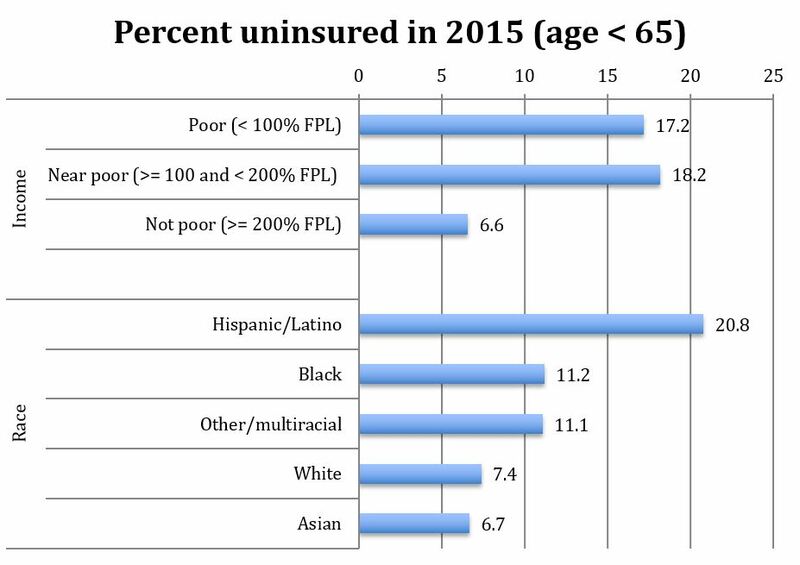 First, Obama barely mentions the more than twenty-five million individuals who — it is estimated — will remain uninsured in the foreseeable future. Nor does he address the stark class- and race-based inequalities in uninsurance that remain. “Health Insurance Coverage: Early Release of Estimates from the National Health Interview Survey, 2015,” National Health Interview Survey Early Release Program (2016). 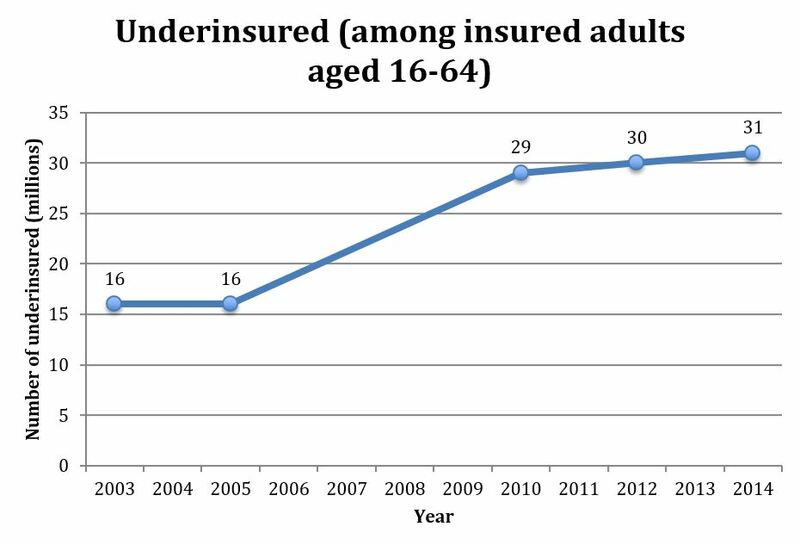 Note: Uninsured as defined at time of interview; see source for methodology. While real universal health care will admittedly not resolve all health inequalities (which stem from many factors), a rudimentary first step would be to ensure that neither race nor class prevents patients from seeing a doctor. A second point to be made about declining uninsurance is that it comes predominantly from the law’s Medicaid expansion: under the ACA, everyone whose income falls below 138 percent of the federal poverty level became eligible to enroll in Medicaid, although a 2012 Supreme Court decision allowed states to decline to participate. In an editorial accompanying Obama’s article, Stuart Butler of the Heritage Foundation quips that the ACA might be better called the “Medicaid Expansion Act,” a development he sees as “troubling.” His orientation towards this aspect of the law is wrong, however: as the largest source of new insurance coverage, the ACA’s Medicaid expansion is actually its best provision. However, while we no doubt should fight to implement Medicaid expansion in the nineteen states that have ruthlessly refused to (at the cost of much bloodshed), we should also bear in mind the program’s shortcomings, which Obama neglects. Medicaid often provides good health-care access, but it can also become a lower-tier program for lower-income and disproportionately minority individuals. Thanks to Medicaid’s lower provider reimbursements, people enrolled in the program far too often cannot avail themselves of the same medical providers as those with private insurance or Medicare. It thus contributes to health-care segregation. Similarly, those with narrow network plans — private insurance plans that limit them to particular providers and exclude them from prominent hospitals — also suffer. Again, Obama does not mention this problem in his paper. One issue Obama does briefly address is the frequently heard critique that the ACA has bolstered the rise of health-care cost-sharing: the payment due at point of use that includes things like copayments, deductibles, and coinsurance. High cost-sharing means the underinsured frequently avoid going to needed doctor’s appointments, having important tests run, or even visiting the emergency room. When they do, they are often left with punishing bills. While admitting that deductibles have been rising, Obama asserts that the rate of increase has not changed. But he misses the point: the argument isn’t that the ACA created “underinsurance” — it’s that it didn’t reduce it, much less eliminate it, which should be our real goal. S.R. Collins et al., “The Problem of Underinsurance and How Rising Deductibles Will Make It Worse — Findings from the Commonwealth Fund Biennial Health Insurance Survey,” The Commonwealth Fund, (2015). Note: Based on studies of 2003, 2005, 2010, 2012, and 2014 data only. See source for underinsurance definitions and methodology. Before the ACA, the health-care system was dominated by “fee-for-service” payment systems, which often penalized health-care organizations and health-care professionals who find ways to deliver care more efficiently, while failing to reward those who improve the quality of care. He proceeds to discuss what is often referred to as “value-based” health care, a benign-sounding framework that is currently on track to restructure how the nation’s entire medical sector is financed. The premise here — pay for quality, not quantity — seems commonsensical. And tellingly, value-based health care has even earned that ever-elusive bipartisan support. Its approach includes pay-for-performance (P4P) programs and encourages “alternative payment models” like accountable care organizations (ACOs). Both of these play a prominent role in the ACA. P4P — “paying for results” — no doubt sounds exceedingly reasonable, particularly for anyone who has experienced poor, neglectful, or inhumane treatment. However, in both concept and practice, pay-for-performance threatens the health-care system in the same way such rubrics have been a disaster for American education. In schools, financial incentives and disincentives are wielded to “encourage” (or, more accurately, to punish) teachers into raising their students’ test scores. Sometimes, this entails vicious mass firings based on algorithm-derived scores with dubious merit. Though monitoring quality metrics is no doubt important, basing payment on performance metrics — which are determined by a multiplicity of factors outside the control of the doctor or hospital (or teacher or school) — is a technocratic solution to a complex problem that far too often penalizes those who care for the disadvantaged. This ultimately harms their patients (and students). Doctors’ more privileged economic and political position — as compared to teachers — has thus far largely forestalled such measures’ implementation for the medical profession. Things may be beginning to change, however: under the Medicare Access and CHIP Reauthorization Act of 2015, passed with bipartisan support last year, a substantial portion of physicians’ Medicare reimbursement will soon be set by how they score on a variety of quality metrics — unless they join an ACO or something similar, where payment will be determined by both performance scores and spending. Which brings us back to ACOs. As Obama notes, his administration’s goal has been to direct half of all Medicare reimbursements toward ACOs or similar “alternative payment models” by 2018. So what are ACOs, and why should anybody care? “Some people say ACOs are HMOs [health maintenance organizations] in drag,” as one policy scholar told Jenny Gold of Kaiser Health News. Like HMOs, ACOs are organizations of hospital systems and/or physician practices that share risk with insurers, meaning that the medical providers financially benefit when they reduce spending on patient care. There are admittedly differences, including P4P-type requirements that ostensibly help maintain the quality of care. But depending on how things go, some ACOs could prove as unpopular with the public as the corporate HMOs of the 1990s, which were widely (and correctly) perceived as exploitative penny-pinchers. In any event, ACOs’ actual track record of significantly reducing costs is paltry: as Kaiser Health News recently reported, their net savings for Medicare has so far been a big zero. Similarly, although Obama points to some positive examples, little evidence suggests that P4Ps have any effect on health-care outcomes. Just last week, for instance, a study published in the Lancet described how the biggest P4P program on the planet — which applied to nearly the entire United Kingdom, was funded at enormous cost, and provided large financial incentives — had no impact whatsoever on mortality among the conditions it specifically targeted. Obama is excessively optimistic — in all fairness, like seemingly everyone else in the health policy community — that ACOs and P4P will take us to a value-based health-care promised land. As he gets closer to the end of his paper, Obama turns to calls for further reform. Some of these are entirely reasonable — though also entirely inadequate — but his return to a public option has received by far the most attention. Regardless of how one feels about the public option in theory, it’s worth acknowledging how entirely peripheral such a reform, at least as Obama describes it, would be in practice. Obama asserts that the ACA’s marketplaces — the online “exchanges” where those who are otherwise uninsured buy so-called Obamacare plans — serve the vast majority of enrollees well, because competition among plans keeps premiums within a reasonable range. However, 12 percent of enrollees, he notes, reside in areas where only one or two insurers operate. In these areas, competition falters. [A] public plan to compete alongside private insurers in areas of the country where competition is limited. Adding a public plan in such areas would strengthen the Marketplace approach, giving consumers more affordable options while also creating savings for the federal government. In other words, this “public option” would have no impact on anyone currently insured through their employer, and a theoretical impact only for the tiny minority of Obamacare marketplace enrollees who reside in areas with fewer than three insurers. Even there, its potential benefit is questionable for various other reasons, like the fact that a public option could become the refuge of the sickest. (If this were to happen, the public option would functionally subsidize the private insurance industry by taking on the more costly patients, becoming less and less affordable in the process). Those hoping that the public option will deliver the dream of universal, equitable, and comprehensive health care with first-dollar coverage for all are set for the disappointment of their lives if — and when — such a public option is passed. Finally, Obama takes a soft swipe at single payer, noting that its proponents — like conservatives who proclaim vouchers as the answer to everything — fail to see the value in a more balanced, public-private, American-style approach to public policy. On the one hand, this isn’t quite fair: under single payer, though health-care funding would be basically entirely public, most care would still be delivered by private (albeit not-for-profit) hospitals and providers. On the other hand, his dismissal of single-payer is a loud and clear political message, reinforcing the Democratic Platform Committee’s recent, dismal rejection of the plan. Their rejection is particularly galling because — according to a recent Gallup poll — an overwhelming majority (73 percent) of Democratic-leaning voters support single payer, together with some 58 percent of Americans overall. It must be awkward for prominent liberals who disagree with said majorities. A policy idea that commands extremely strong support from their own base — and the public at large — has to be unironically declared a political impossibility, a pleasant-sounding but fanciful health-care castle in the sky. That they have been successful with this strategy so far says virtually nothing about single payer’s practicality or merits, and much about the anemia of American democracy. President Obama’s new paper defending the Affordable Care Act only shows why we need single-payer health care.